IRPRESUNIV.ORG, CIKARANG - Thursday, (24/1), the International Relations Study Program of President University conducted an Ambassador Lecture with the theme: “Norway-Indonesia: Moving Forward Together,” which was moderated by Mr. Anggara Raharyo, a beloved lecturer of the study program. 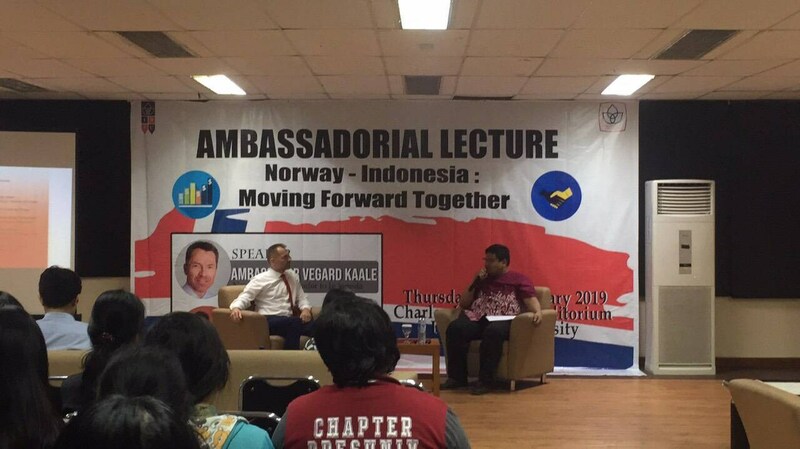 The Ambassador Lecture had the honor of being led by His Excellency (HE) Ambassador Vegard Kaale, the current Ambassador of Norway to Indonesia. Several points were delivered by HE Ambassador Kaale in the topic of cooperation, past and current relation between both Norway and Indonesia, including the common factors that Norway and Indonesia share in many aspects that would be beneficial for future plans. HE explained that because of common factors, the relation between the two nations have been beneficial and helpful, including that Indonesia is the largest archipelago country in the world, and Norway is the largest archipelago in Europe, explaining in-depth of their close encounter with the ocean. HE Ambassador Kaale’s topics mainly revolved on the usage of natural resources that the two states are able to benefit from in terms of export and import, mentioning that Indonesia and Norway have engaged in bilateral trades amongst energy, especially since Norway is a large producer of oil and gas, taking into the act of hydro power, while Indonesia are also producers of oil and gas, and have large gas and oil reserves, bringing the two nations closer. HE Ambassador Kaale had mentioned future plans for the relation between Indonesia and Norway, which consisted of the decreasing of deforestation because while Indonesia has an abundant supply of natural resources, HE believed that the resources needed to be dealt with a sustainable manner to keep them lasting longer. The other future plans included ocean resources, whether it be fishery, hydro power, etc., mentioning once again about the sustainability of these resources. Not only was the topic of resources was brought up, but also the topic of human rights and development had emerged. What HE Ambassador Kaale had not only explained about the benefits in the progression of Norway’s development with their resources, but HE had frequently mentioned in aiding Indonesia with their progression with the usage of our resources, how to preserve them but still benefit from said resources. HE hadn’t focused the topic on mainly what Norway wants, but what both nations need and how they could fulfill them together, which correlates greatly with the topic of ‘Moving Forward Together’. HE Ambassador Kaale delivered his presentation clearly, despite being slightly tensed in the beginning, HE gradually created a comfortable atmosphere along with our moderator, Mr. Anggara. Questions and answers session went on smoothly with a total of four questions from each Batch that had attended the seminar, and ended off with the token of appreciation awarded to HE Ambassador Kaale before photo sessions with the lecturers of the study program and last was the photo session with the audience. The Ambassador Lecture seminar was attended by approximately 169 students from Batch 2016, 2017, and 2018 of the International Relations Study Program of President University. Despite the hectic preparation, the event was deemed a success and hopefully had given the students that attended the seminar in-depth insight on the relation between the two nations, and will hopefully be responsible for the future plans that HE Ambassador Vegard Kaale had delivered during HE presentation.